1898 America bought the Philippines for USD 20 Millions from Spain. Today's worth would be USD $543,691,923.00. Imagine the Americans came today and would pay USD 5 or PHP 250 for each Pinoy or Pinay. Afterwards, the Commonwealth system brought some superficial freedom. Within the own boarders the Philippine government had authority. But for any negotiation with foreign countries or companies, they needed to ask Uncle Sam for permission. The Partido Liberal wanted to become a state of the United States. The communists wanted independence. America refused both ideas. The communist party was immediately declared illegal by the Supreme Court. 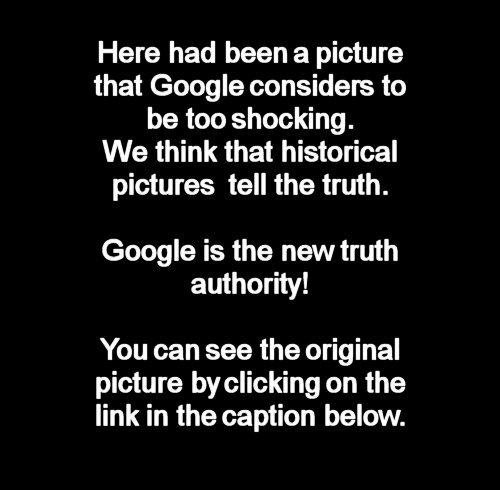 World War II had been atrocious all over our planet. The Japanese arbitrary terror and the rice starvation killed about a million Filipinos. The Americans came back and finally brought freedom and independence to the Philippines. In 1946 the Philippines became a free and rather independent country after over 400 years of slavery and colonialism. Today these 400 years sit still deep inside the Filipino's soul. The hope is with the young intellectuals. December 10 1898 In the Treaty of Paris, Spain sells the Philippines for $ 20 million settlement to the US. Philippine representatives are not involved in these negotiations. The Americans pursue primarily strategic interests with the acquisition. The Philippines is an important location for them in the enforcement of their sales interests in the Pacific. These interests are threatened by other colonial competitors (including Germany, Japan, France). The new colonial power, however - especially in the thirties, and in contrast to the former Spanish colonial power - will give the Filipinos much greater autonomy in internal affairs. December 21 1898 The American President McKinley claims in a statement the US's sovereignty over the Philippines. He promises a "benevolent assimilation" of the Philippines, taking into account rights and laws. The annexation is also criticized many times in the states and happens only with difficulty the American Senate. 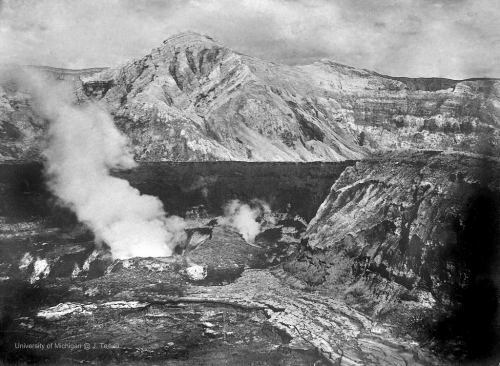 For example, American steelmaker Andrew Carnegie wants to repurchase the Philippines for the Filipinos for 20 million. The American humorist Marc Twain also strongly denounced American imperialism. January 21 1899 Aguinaldo, who was disappointed by the earlier American commitments, calls for a revolutionary congress in Malolos. This is the "Malolos Constitution". It sees a republic on the western model with a strong weight of the legislature. Two days later Aguinaldo was named President of the First Republic . The new colonial leaders do not recognize the government of the "outlaw bandit" (lawless bandits). Aguinaldo warns the Americans before armed conflicts. 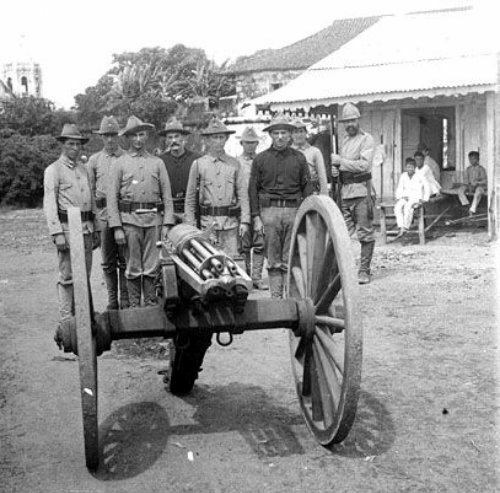 February 2 1899 Outbreak of hostilities between the Americans and Filipinos by a controversial incident, where a Filipino soldier was allegedly killed by an American patrol. February 5 1899 Aguinaldo declared war on the Americans. This is the beginning of the Philippine-American war (1899-1902). The Filipino troops are badly armed and are fighting mainly from the ground. The armed conflicts, particularly in Luzon, are brutally tortured and arrested. February 6 1899 The US Senate ratifies the Treaty of Paris. The military is empowered to "pacify" the country and to assure American supremacy in the Philippines by force. March 4 1899 The Schurman Commission arrives in Manila. It emphasizes once again the pre-eminence of the USA, promises however at this early time the full autonomy of the Philippines. April 29 1899 The Spanish Archbishop of Manila excommunicated the military vicar Aglipay, appointed by Aguinaldo. He later founded the "Iglesia Filipina Independiente", an independent church independent of Rome. May 6 1899 Mabini's peace talks with the Americans fail. The American General Otis insists on an unconditional surrender. June 5 1899 General Antonio Luna, who leads the Philippine troops, is shot by an Aguinaldo supporter. Aguinaldo now takes command of the Philippine guerrilla fighters. October 12 1899 The Americans are launching a military large-scale offensive with 126,000 soldiers. Aguinaldo goes into underground. 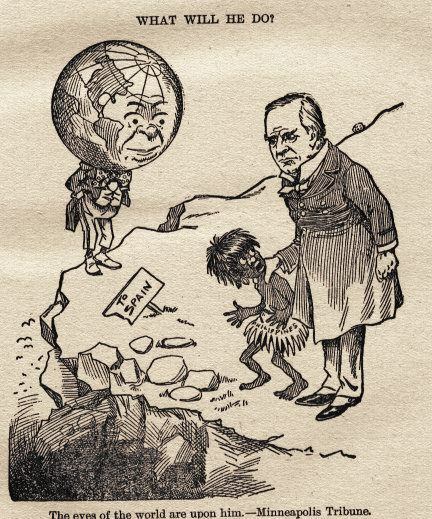 1898 political cartoon showing U.S. President McKinley with a child "savage". 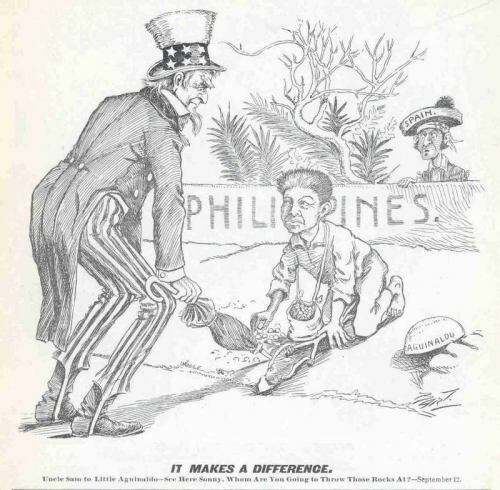 December 23 1900 The "Partido Liberal", founded by Filipinos, pleads for a connection of the Philippines to the USA. However, she can not go through with her plans. March 2 1901 The plenipotentiary of the American president now "civil" the Philippines. Formally, the military regime ends over the Philippines. March 23 1901 Aguinaldo is arrested. Already a week later, he makes his allegiance to the US and calls on his fighters to lay down their arms. He announced during these days that the freedom of the Philippines will come thanks to the "generosity" of the US. The first Republic of the Philippines failed. July 4 1901 The Americans proclaim the end of the American-Philippine war, but the fighting of individual groups of resistance continues - especially in the Muslim regions in the South - until 1913. The information about the number of victims of the relentlessly conducted war fluctuate. It is estimated that 4200 American and 16,000 Filipino soldiers were killed. Information on the victims of the civilian population - including deaths from hunger and disease - varies between 100,000 and one million. William Taft becomes the first American governor-general. September 27 1901 Surprise attack of the Philippine guerrilla captain Daza on an American military camp on Samar, where half the American soldiers are killed. 300 Marines are then mobilized under Brigadegeneral Smith. He gives orders to kill over 10-year-olds who can carry weapons. November 4 1901 The "Sedition Law" is passed. It provides the death penalty or long-term prison sentences for those who propagate the independence of the Philippines or the separation from the US. February 2 1902 Isabelo de los Reyes founds the first union. 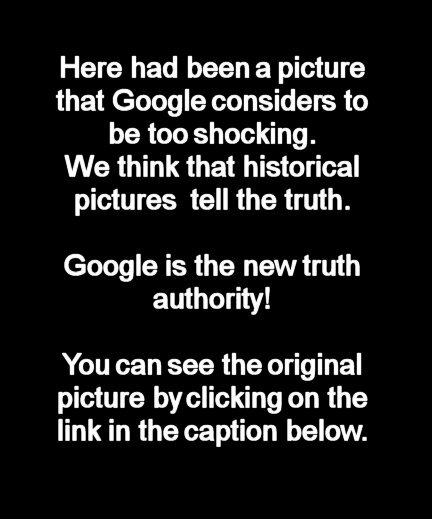 - 1902 Adopting the "Cooper Act" by the US Senate. According to the American model, it provides for a two-chamber legislature with a lower and upper house for the Philippines. - 1903 Governor Taft formulates the slogan "The Philippines the Filipinos" and promises to put the administration in the hands of the Filipinos, if stable government conditions exist. However, he still has a vetress and controls the executive. In the meantime, outdated Spanish laws are gradually being abolished, the infrastructure improved, the education and health system is expanded and modernized according to the American model. Approximately 600 American teachers brought to the Philippines. English is declared the official language of the country. - 1904 The American civil administration adopts a law according to which the Catholic Church has to sell most of its land. The land is re-distributed. Increasingly, Filipinos also occupy higher church offices. The extremely uneven distribution of the soil is nevertheless retained. June 30 1907 First congressional elections, after free party foundations had previously been admitted. Until the end of the war the "Partido Nationalista", which is regarded as moderately conservative, will have the political majority under Manuel Quezon and Sergio Osmena. - 1908 The "University of the Philippines" is founded. - 1909 Free trade with the United States with favorable special conditions for the import of American finished goods and the export of Philippine agricultural products. Foreign trade is largely concentrated in the USA. Industrialization is largely excluded. October 16 1916 The Democrats are now reigning in Washington. The "Jones Law" is passed, there is an exclusively Philippine legislature with the House of Representatives and the Senate. 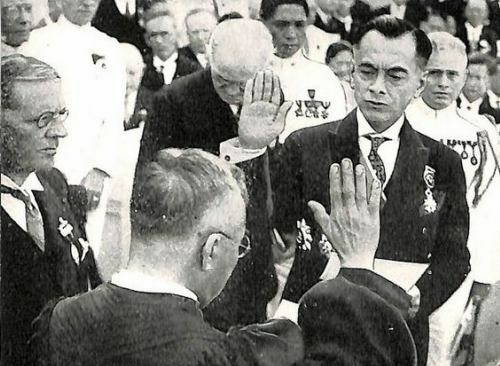 Manuel Quezon (1898 - 1941) is elected President of the Senate and Sergio Osmena (1898 - 1961) as Speaker of the House of Representatives. January 11 1917 The first Philippine Cabinet of Ministers, which is primarily recruited from representatives of the old power and economic elites. - 1918 The Philippines is participating on the side of the US on World War I, sending 25,000 soldiers to Europe. - 1925 The unequal distribution of land is increasingly the problem of strikes of dissatisfied farmers and workers. They continue until 1940. October 26 1932 The "Communist Party of the Philippines" is declared illegal by the Supreme Court. March 24 1934 US President Roosevelt approves "Philippine Independence Law". It provides for a 10-year transitional period as a "Commonwealth of the Philippines" before the ever-promised full independence. May 14 1935 The "Commonwealth" constitution is passed in a referendum. September 17 1935 President Quezon is elected President and Sergio Osmena vice-president in the presidential elections. November 15 1935 The "Philippine Commonwealth" is officially put into force. This status includes, in particular, the internal autonomy of the country. Decisions about foreign trade, immigration and currency still require the consent of the American President. The office of the US Governor-General is dissolved. The American interests now take on high commissars. December 21 1935 Introduction of general military service and building of a separate army. 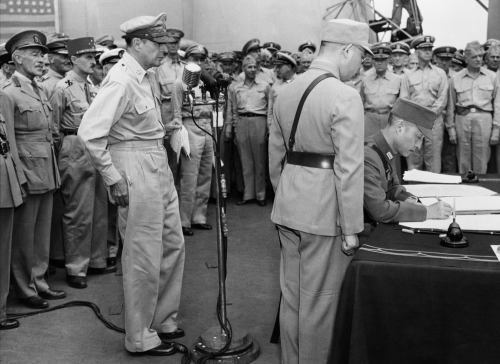 July 26 1941 The Philippines is in an alliance with America. One is concerned about the Japanese expansion impulse. On the advice of the Military Minister of the Philippine Commonwealth Douglas MacArthur, the Philippine units are integrated into the "United States Army Forces in the Far East". The combined troops comprise about 110,000 men. November 11 1941 Re-election of President Quezon and Vice-President Osmena. December 8 1941 Immediately after the bombing of Pearl Harbor (07.12.) Japanese aircraft attack Manila. 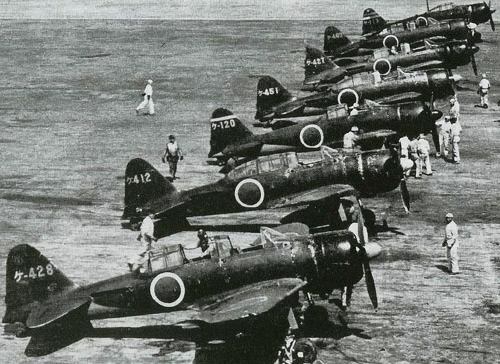 Japanese military forces land in northern Luzon and Mindanao (10 December). The invasion hits the Filipino and American troops unprepared. General MacArthur, now commander of the American forces in the Far East, withdrew to the Bataan Peninsula before the troubled Japanese troops. December 20 1941 President Quezon withdrew with his government cabinet to the fortress of Corregidor Island. December 26 1941 Manila is abandoned. On January 2, 1942, the Japanese troops entered Manila. The Philippine-American army withdrew to Bataan. January 3 1942 The Japanese chief commander, General Homma, announces the end of the American occupation. The Japanese troops had come to free the Filipinos from American oppression. The Philippines should become an "independent member within an East Asian prosperity zone". Without prejudice to his pan-Asian manifestations, he imposed the right of war over the country. January 13 1942 A law provides incitement, the destruction of military property, drinking water poisoning as well as robbery and plunder under death penalty. February 20 1942 President Quezon and his Cabinet escaped to the United States to form an exile government. March 11 1942 The former military adviser and now General MacArthur, whose father was also the last American military governor, went to Australia to take over a higher military command. Before that he gives the Filipinos the promise "I shall return". March 29 1942 It forms the anti-Japanese, partisan movement "Hukbalahap" (also "Huk") under its left-oriented leader Luis Taruc. The roughly 30,000 strong "Volksmeen" pursues their own goals. MacArthur declines to cooperate with her because he assumes that she wants to introduce communism to the Philippines. In addition to the "Hukbalahap", pro-American resistance movements also form. April 9 1942 The American and Philippine troops under General Edward King, on Bataan, surrender. The Japanese send 80,000 captured soldiers to a "death march" with subsequent concentration camp-like imprisonment. 36,000 soldiers do not survive the torture. September 20 1943 A Japanese-friendly National Assembly is called. 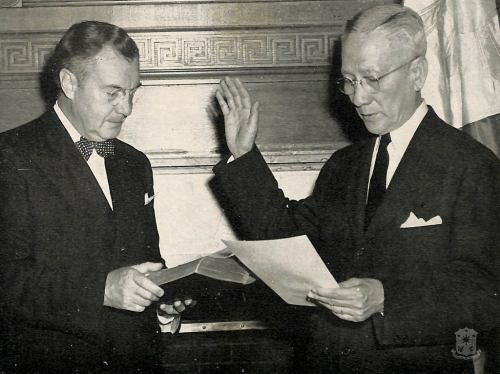 She elects Jose P. Laurel as President of the Second Republic of the Philippines . After the end of the war, he will emphasize again and again that he has collaborated with the Japanese occupiers in order to make their arbitrary rule more bearable. A minority among the Filipinos collaborated with the Japanese occupiers. However, the majority rejected the Japanese occupation regimes. - 1943 Rice starvage in the country. The Marionette government under Laurel calls for a "green revolution" to counter food shortages and famine. Most historians speak, at the latest from this point, of a beginning arbitrary terror of the Japanese. They control 12 of 48 provinces of the country. August 1 1944 In the US, Quezon dies from tuberculosis. His successor will be the former Vice President Sergio Osmena. September 21 1944 Heavy air attack by the Americans on Manila, which calls for many civilian victims. Under pressure from the Japanese, President Laurel declared war on America. >October 20 1944 General MacArthur landed with four armored divisions and over 650 ships on the island of Leyte. There are further landings on Mindoro and Luzon. February 4 1945 American troops in front of Manila. 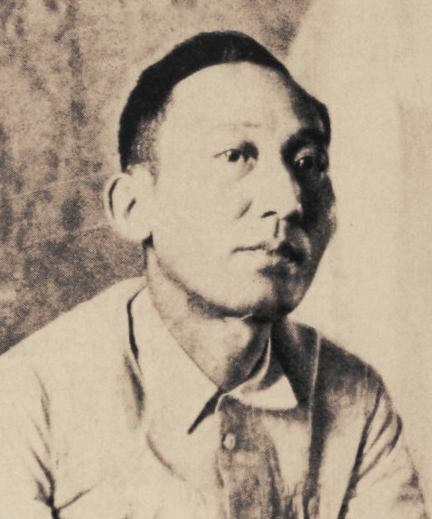 February 22 1945 Luis Taruc and other HUK leaders are arrested by the US secret service. They are accused of their communist sentiments. February 24 1945 Battle for Manila. It comes to a relentlessly led house battle with strong Japanese counter-defense. Japanese troops are massacring the population. In the end, Manila is one of the most destroyed cities in World War II. 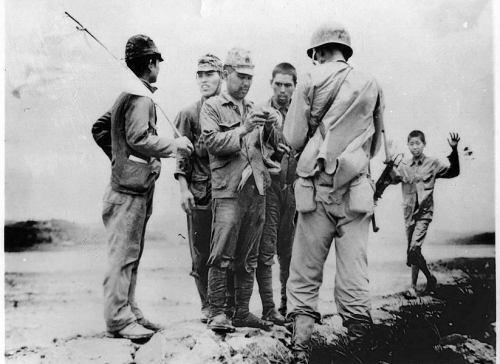 The Japanese troops surrender. Exile President Osmena again refers to the Malacanang government palace and forms a government. March 22 1945 Marionette president Laurel is looking for refuge in Japan. June 5 1945 The congress, which was elected in 1941, meets again and elects Manuel Roxas as spokesman. July 7 1945 General MacArthur proclaimed the liberation of the Philippines. The rate of military service in the Philippines cost about 300,000 Japanese, 60,000 American and about 100,000 Filipino soldiers. Civilian casualties are valued at a million. August 15 1945 After the American atomic bombshells on Hiroshima and Nagasaki, Japan capitulates officially. September 12 1945 Marionette president Laurel is arrested in Japan and sent to the Philippines to be sentenced. April 20 1946 Manuel Roxas from the Liberal Party defeated Osmena from the Nacionalista Party in a presidential election.